November includes my favorite holiday – Thanksgiving! Why is it a favorite? Because taking some time to focus on thanksgiving – assessing all of the things you have to be grateful for- is a wonderful way to build your confidence and optimism. Focusing on appreciation instead of problems is the biggest success secret you will ever discover. Most of you have probably realized by now that if you focus most of your time on things that are not going as you want them to in your life, it can be depressing. If you allow yourself to get depressed, that can sap all of your energy – particularly your creative energy. Depression breeds deeper depression – it is a self fulfilling prophecy. Pretty soon you start thinking you are a victim and that you have no control over the lousy hand of cards life has dealt you. That of course just brings you more of the same and things will continue to get worse or seem worse even if they are not. So, how do you get out of this spiral of not having a good time? You need a change of Mind! That’s where THANKSGIVING comes in. It’s about changing your attitude and breaking a non-productive cycle. If you take the time to focus on things you are thankful for it will chip away at any feeling of depression or hopelessness. The more you focus on the things you are thankful for the better you will feel. Everyone can be thankful for a sunny day, a good friend, a good meal… take some time to find a bunch of things you can be thankful for and spend some time – ideally at the start of your day and as often through the day as possible – feeling good about those things. As you are working on projects or handling your daily responsibilities, take the time to be thankful for each success along the way. Always be on the lookout for things to appreciate – try not to miss acknowledging any of them. Even when you pay a bill say to yourself, “I’m glad to pay this because it is helping many other people who are getting paid for being a part of the process”. Thanks and praise will keep you feeling great and life will be a lot more fun and stress free. Here’s the thing – the more you can stay focused on “feeling good” instead of “feeling bad” the more energy you will have to keep things going the way you want them to go. 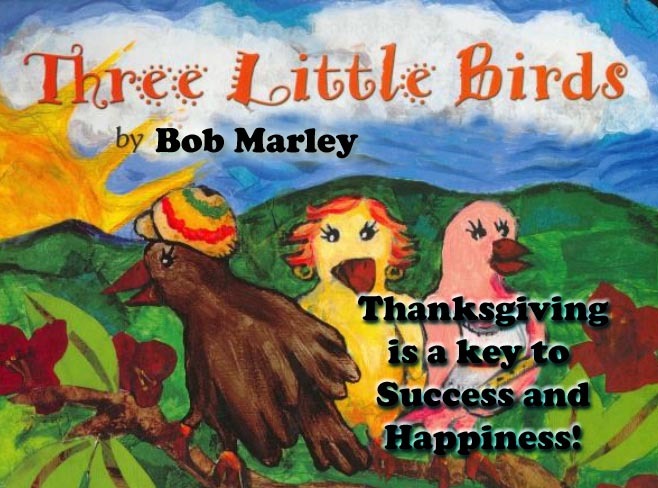 There is a great song by Bob Marley called “Three Little Birds” – it has a great message: “Rise up this mornin’, Smiled with the risin’ sun, Three little birds pitch by my doorstep… Singin’ sweet songs of melodies pure and true, Singin’: “Don’t worry ’bout a thing, ‘Cause every little thing gonna be all right!” Listen to the song. Just singing it to yourself can help you get that “thanksgiving” feeling going. If you want to get the most out of life and “Be Happy” catch yourself every time you start feeling sorry for yourself and find some things you are thankful for to think about. Taking time to pay attention to every little success or good thing in your day will propel you to days filled with positive accomplishments and joy. Happy Thanksgiving!